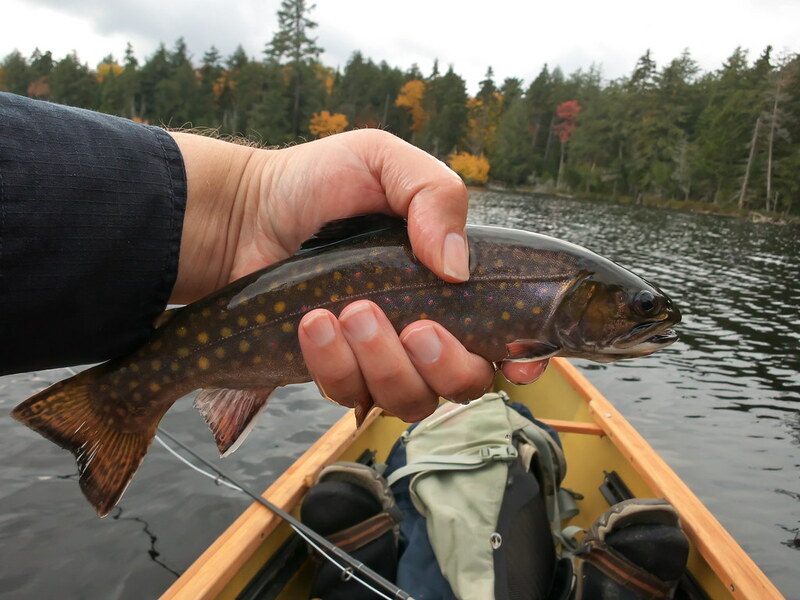 Made the end of season trip to the Adirondacks to chase fall Brook Trout. Due to dreary weather, stayed in Glen’s Falls / Queensbury vs. camping. Thursday was a rain day, so processed videos and pictures from each day’s trip. 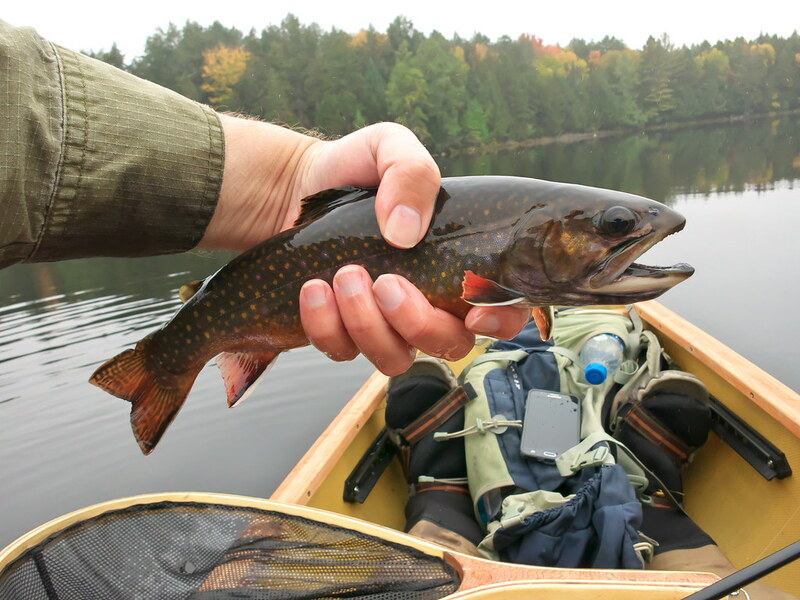 This is only my 2nd trip with the new 12-1/2 ft Hornbeck canoe, so am transitioning from float tube fishing to fly fishing out of a canoe. 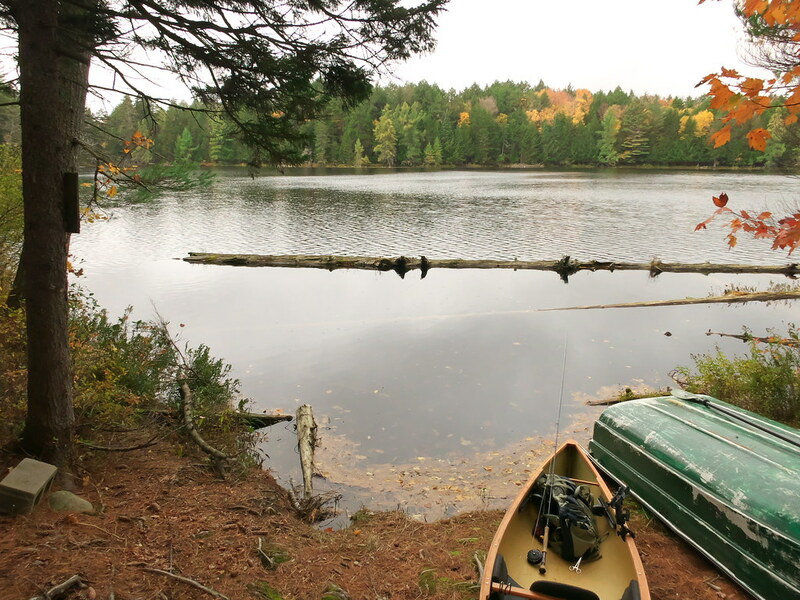 I picked ‘Lotsa Trees’ Pond as 1) it’s a little more work to get to than the other area ponds and 2) the 1986 ALS survey showed it to be a Brook Trout monoculture. This was a significant first, for me, as it involved crossing a water body to get to another water body that I wanted to fish. Not something one can do in a float tube. Arrived at ‘Beaver’s Lake’ around 8:30 am. Wasn’t sure where I could park and put in, so ended up going in at the carry across from ‘Thin’ Pond. 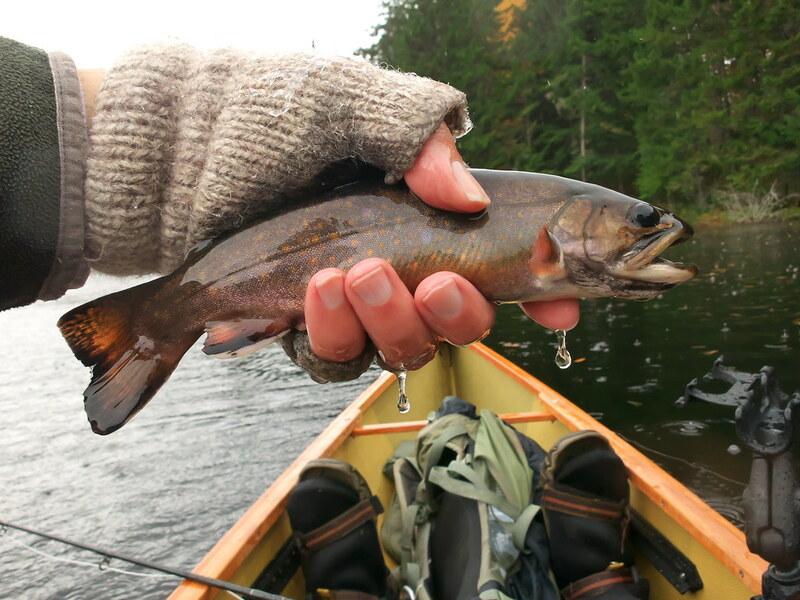 This involved crossing ‘Beaver’s’ Lake and paddling down the western shoreline to find the western-most finger bay. Took me about 30 minutes to make the paddle and found the carry trail to ‘Lotsa Trees’ Pond. Trolled around the pond using my standard rig: an intermediate fly line and 3 flies…..A.P. Emerger (top fly) followed by a Denny’s Olive Peacock Callibaetis Nymph, and a sz.12 Maroon Simi-Seal Leech as the point fly. Great action…..not so great at catching. 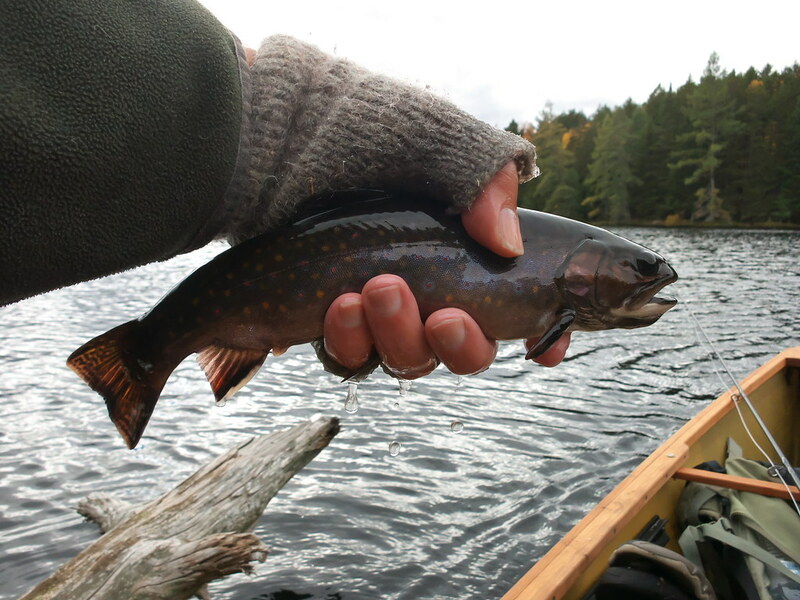 I caught and released 8 Brook Trout in approx. 5 hours of fishing. These were mostly 11-13 inches (pics follow). I missed and/or lost probably twice that many fish. Just after lunch I was completing a pass which put me real close to the shore by a point on the south side of the pond. I made a hard turn which pulled the flies up and had a good grab. It didn’t take long to realize I was into a big fish. 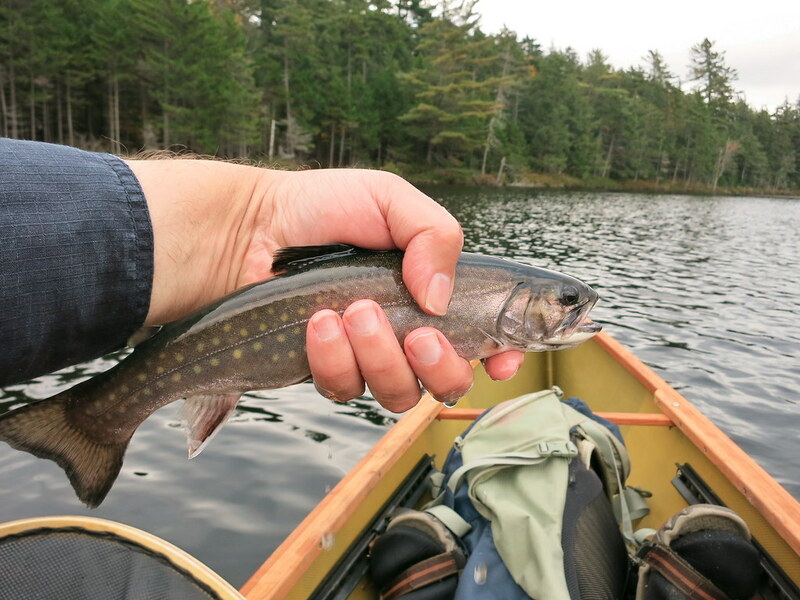 He was able to pull the canoe around’ for a few minutes before I lost him. Fish were located in 10-17 ft of water just off the shoal on the northwest corner of the pond and also close along the west shoreline. 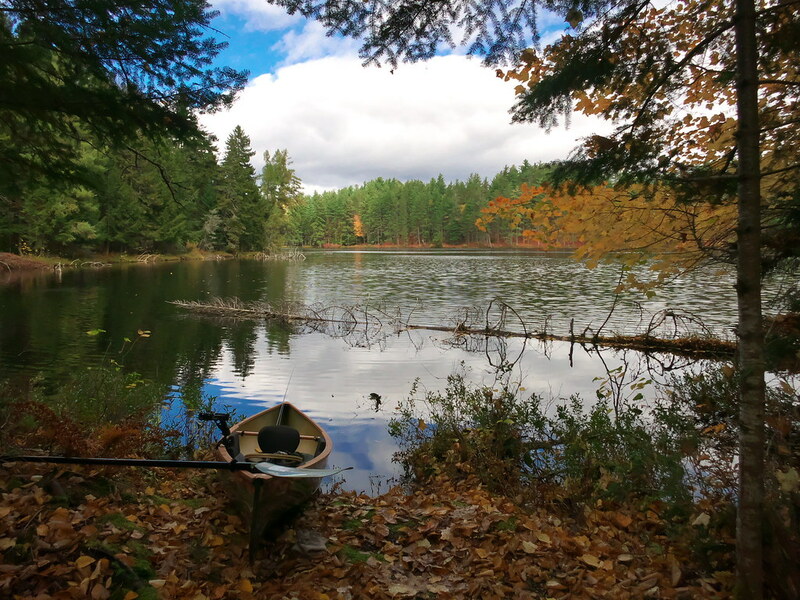 Its about 1.3 miles from the ‘Thin’ Pond carry put-in, down ‘Beaver’s’ Lake to the ‘Lotsa Trees’ Pond carry. On the paddle out, I spotted what looked to be trail and a put-in on the southern end of the lake which would be a much shorter paddle. About an hour into the drive back to Glen’s Falls, I developed excruciating pain in the middle part of my back. At first, I wondered if I was having a heart attack. Then realized it was a muscle cramp from all the day’s paddling. Several motorists passing by were treated to a sight of me pulling on a post at the Balfour Lake parking area to stretch out the cramped muscle. 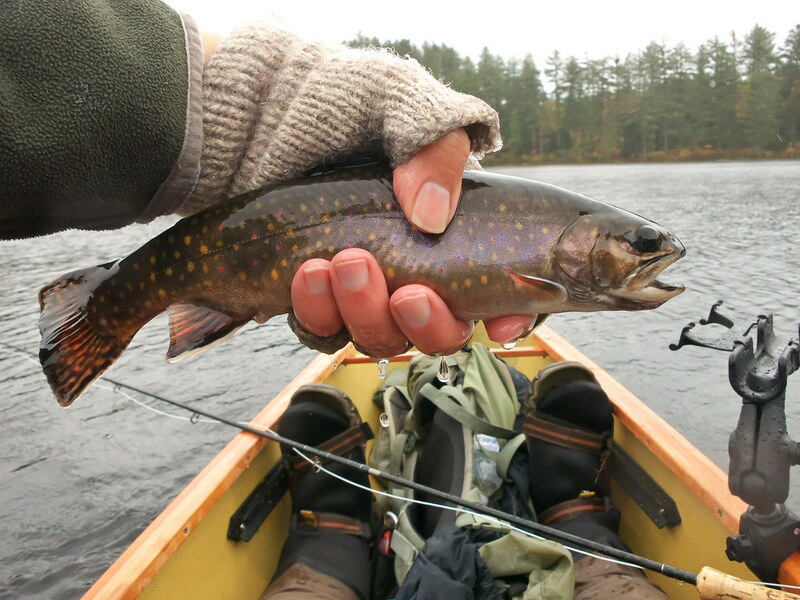 When I fish the Adirondacks, I always make a trip here. 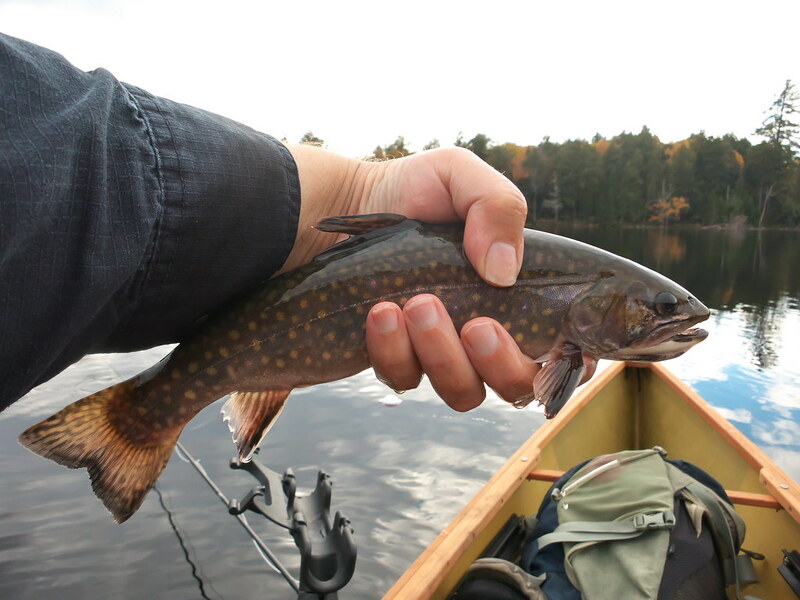 It has heritage Brook Trout and I’ve never been skunked here. 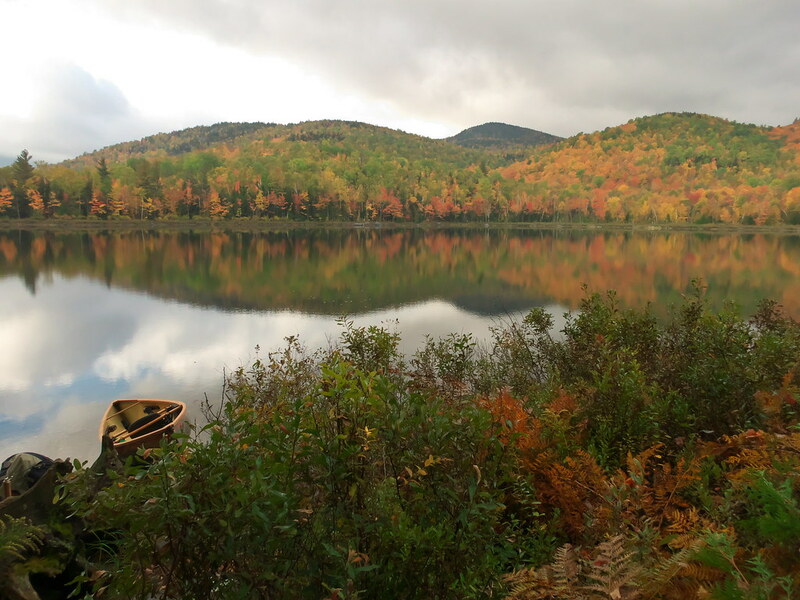 Weather-wise, this was the best day of the trip with great scenery from the fall foliage. The mountains looked like they were on fire. There is a first time for everything and I was skunked here…..not even a strike. I trolled the same 3 flies from the day before with the intermediate line. Later, I switched over to a Type 3 sinking line, trolling 3 flies, to probe the bottom. I was shocked at my lack of success. Parked at - and made the carry in - from the gate at the head of a DEC truck trail. The foot trail turn off, to the pond, is not marked, but, I took my first right and arrived at the pond in short order. I was initially alone. Around 10:30 or 11 am, another guy showed up pulling a loaded Sportpal 55 canoe in. He was trolling a Wabler. 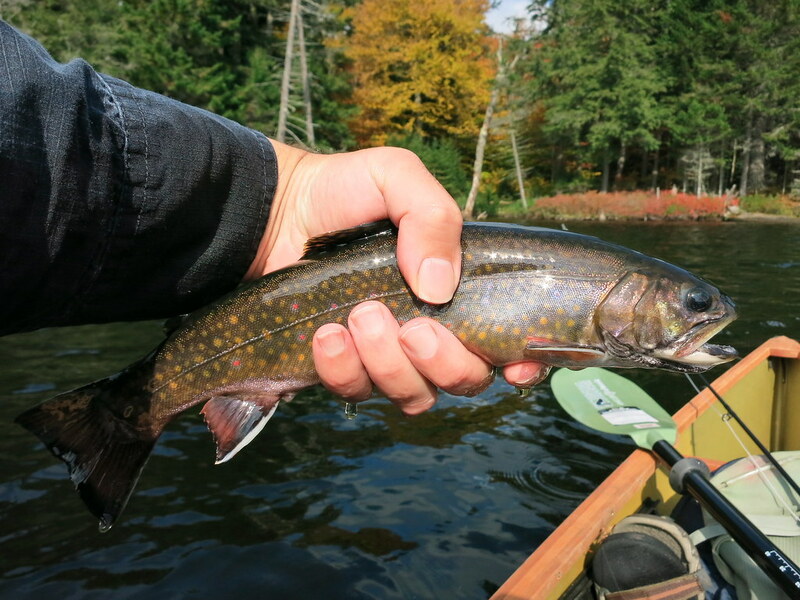 Using the intermediate line and my standard 3 flies set up, I ended up catching and releasing 11 Brook Trout in about 6-1/2 hours. As usual, I missed and/or lost several more. Most of the fish were 11-12 inches with a few nosing 13 inches. 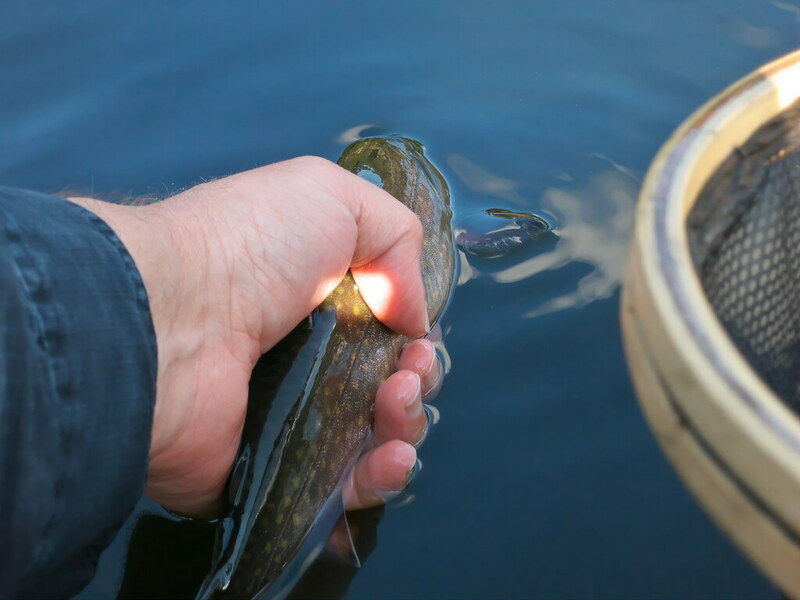 The vast majority of the fish were hooked on the north and northeast side of the pond where the depth transitions from about 11 feet to 20 feet. A couple were hooked as I was crossing the center of the pond. It appears the pond is capable of growing big fish, but, I suspect the bigger ones are harvested due to the pond’s (relative) ease of access. Still, it’s a good place to go. I reluctantly left around 4 pm. I’d seen a few rises as the afternoon wore on and felt the fish were just getting started. 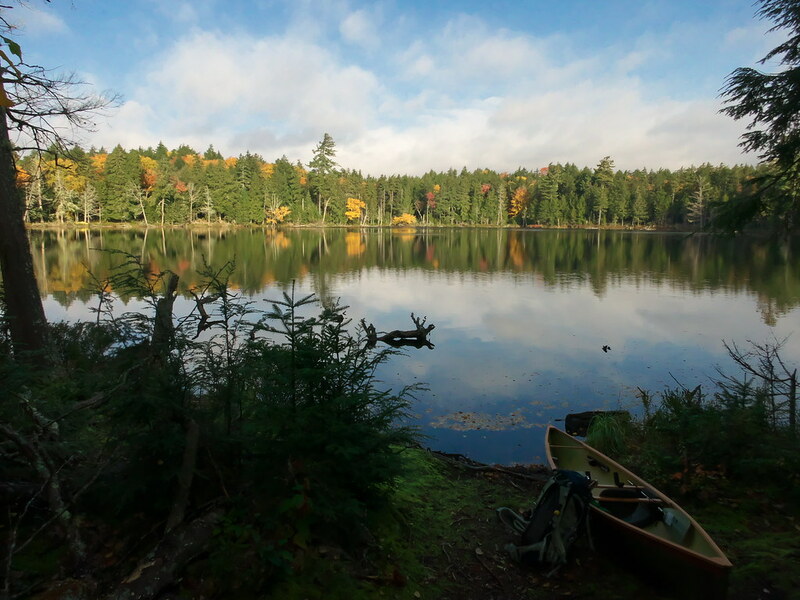 I’d thought about some other options for my final day, near Saranac Lake, but decided to go back to the ‘Beaver’s’ Lake area and revisit ‘Lotsa Trees’ Pond. This time, I went further down the road and parked at the ‘Farrier’ Pond parking area. I then took a foot path which put me at yet another carry put-in on the south side of ‘Beaver’s’ Lake. This ended up reducing the paddle to the ‘Lotsa Trees’ Pond carry point down to 10 minutes or so. I was at the pond and ready to fish by 9:30 am, but waited due to unexpected rain and wind. A front had passed through and it was a good 25F cooler than the day before, so, I didn’t know how the pond would fish. 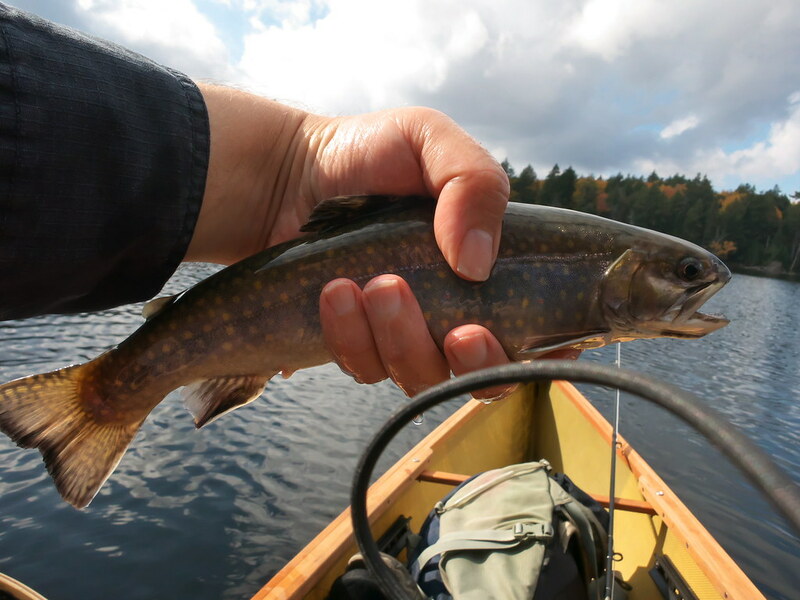 I had caught and released 7 by lunch. 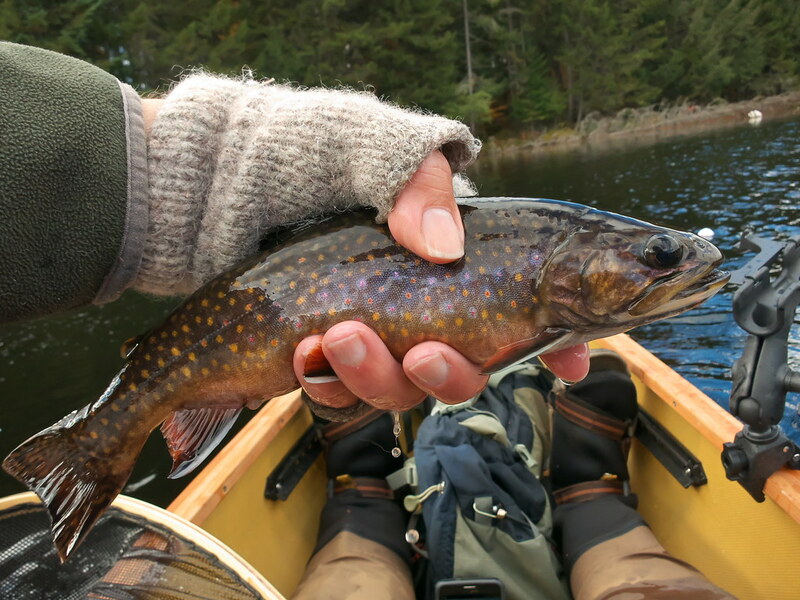 Immediately after lunch, I resumed trolling at the edge of some leaf litter on the west shore and hooked one on the Olive Peacock Callibaetis Nymph and, as I was getting him towards the boat; a second Brookie grabbed the mini-leech. I actually managed to get them both into the net. 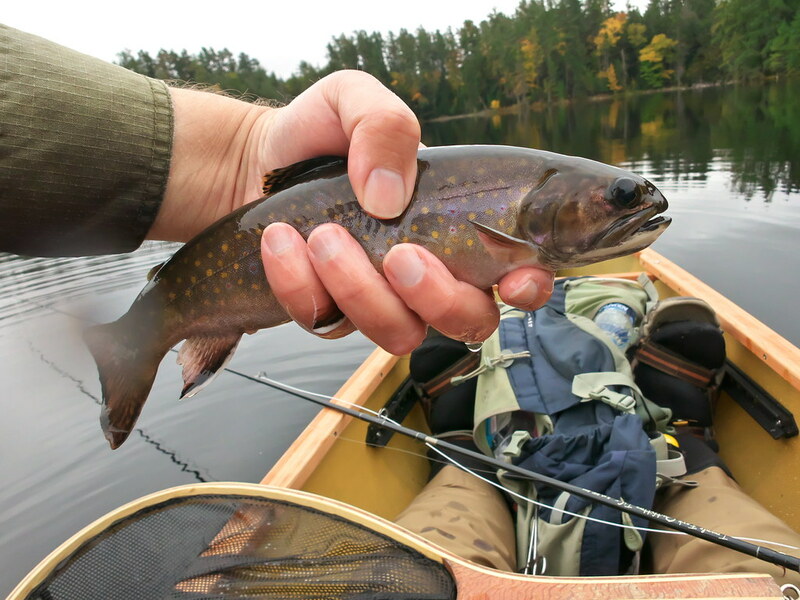 This is what a fall Brook Trout should look like! Great picture and report. Thanks for sharing. Very nice. Great report and photos. 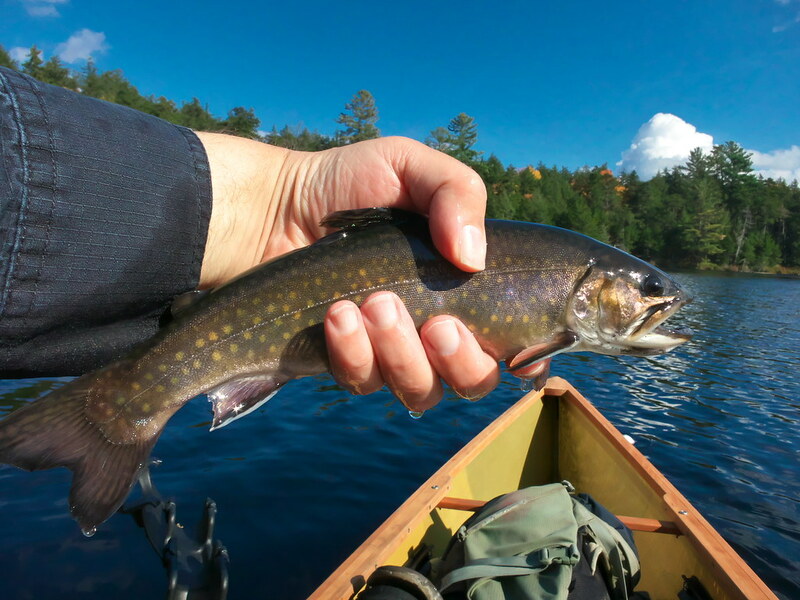 Looks like you're getting used to the canoe. Nice pics! 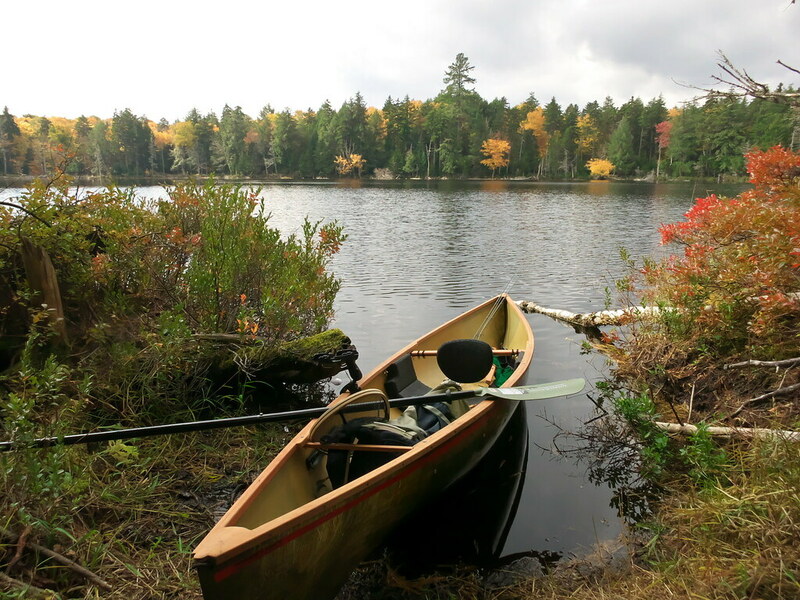 Does the canoe still feel tippy to you? Last edited by JohnnyVirgil; 10-16-2018 at 05:23 AM..
On arrival at "Lotsa Trees" did you feel a bit deflated (or some other emotion) seeing the row boat stash at the launch? Thanks for taking the time to post your trip. Nice pics! 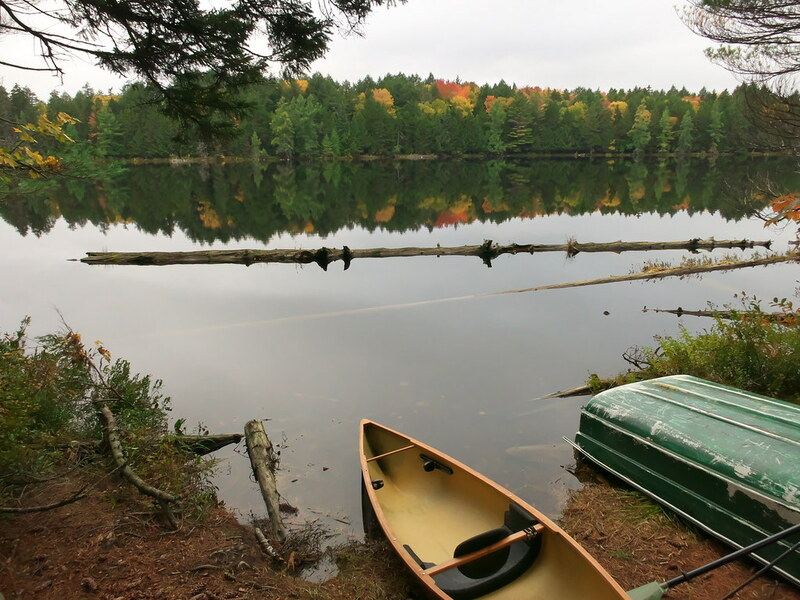 Does the canoe still feely tippy to you? After 6 outings; I'm certainly more comfortable with it. It rocks/sways more than I thought it would, though. Not sure what you're referring to. However, the waders are the Cabelas packable lightweight waders with neoprene socks. I wear sz 12 Teva sandals with them. And I've carried 0.6 miles each way on flat trails with those. 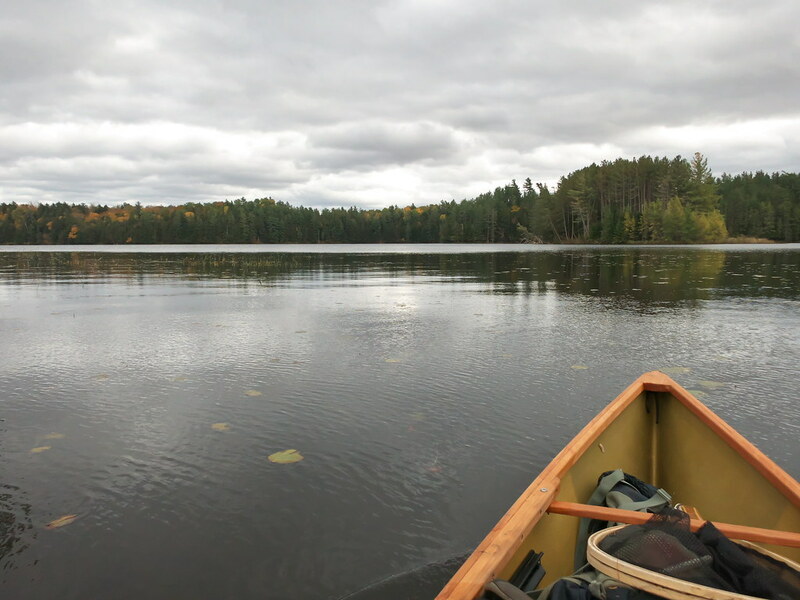 I've fixed or developed workarounds for all of the canoe issues, save one: stationary casting and retrieving. Even the slightest of breezes blows me around in a circle making (fly) casting and retrieving control difficult. I'm not sure what the fix is.....anchors would add weight and bulk to any carries. Not sure if a sock would help..... Anyone have advice? You could bring some paracord or something similar and make an anchor when you got there with a little stuff sack and a rock perhaps? Carry a couple of mesh onion bags and some paracord, when you get to your destination put rocks in the onion bags and tie them closed with the parcord, and you have two anchors. For the pulley rig for getting them to the front and rear of the boat, you are on your own. Yeah, this here. A decent netted bag (I use the one my yakima canoe pads came in) and I'd skip the paracord only because it soaks up water like a sponge and stretches. I've largely switched out all my paracord for dyneema-based cordage like this. A little more expensive, but vastly better and lighter/smaller. Edited to add: great pictures and excellent fish! Nice report and pictures as always. I was on Lotsatrees this spring when there was still some ice on the pond and was treated to the cat and mouse game between a loon and a bald eagle that was intent on making it a meal. This lasted an hour with the eagle nearly successful on a dive bomb when the loon was surfacing. Eventually the eagle gave up and moved on when the loon stayed on the surface so it could see it coming. Nature is metal. Nice report. Good to see that you were successful. My wife and I had a discussion with you at the parking lot for "Lotsa Trees" pond on your first day. 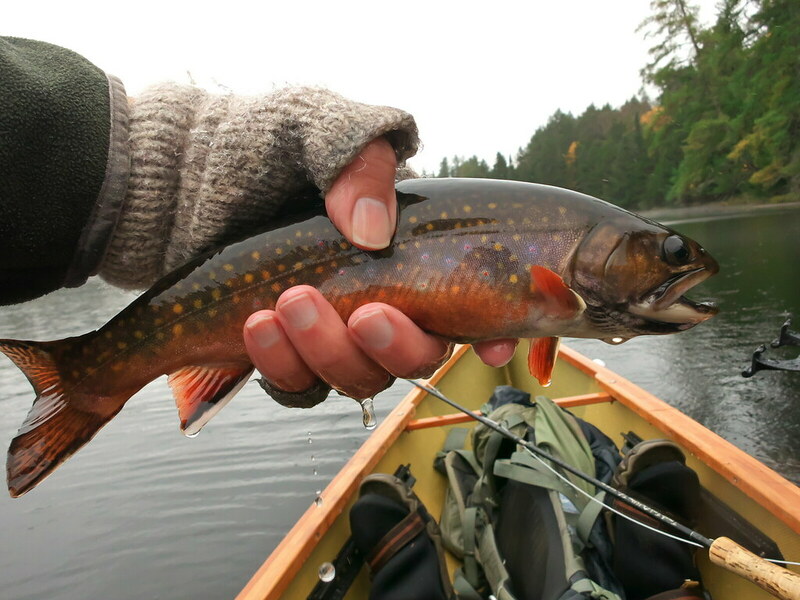 Beautiful colored up fall brookies! And awesome ,detailed report.Fun read!Thanks!! p.s...I don't see a lot of the ol' regulars here anymore.Did they move on elsewhere? I haven't posted anything lately because I haven't been out .Hoping to hit some water in a few weeks. p.s.s. Hey UpstateDave! Are the chromers running yet? ya WB, I miss the regulars. Forum has died down substantially. What about you, what's keeping you off the water? Haven't seen a post from you, man, pushin a couple years now. Yeah, I think I did post at sometime how bad the low conditions were on our fave rivers the last few years and nothing exciting to post ,and this year wasn't too bad conditions wise in the spring but dropped badly in June and so on.Lots of small stockies and a few 1 year holdovers,nothing good enough to post though. Then, my daughter got married a few weeks ago and now we are doggie sitting their big creatures while they are honeymooning.Lucky us....hoping in a few weeks to hit some waters that are open year round.I ,hopefully then will have something to post.Hows your fall fishing going gmorin? Oh really? great for you and your daughter that must be an exciting time for your family, congrats! I haven't been able to get out much, coaching football has been consuming my time. We were destroyed by Cambridge today so hopefully I can get out on our year round river and then for some steel! That'll make me feel better for getting killed haha. awesome report. the color variations of those fish are amazing. Thank you Gmorin! It was a happy ,but some mixed emotions weekend..I wrote and made a speech ,depicting some of what we did together in the outdoors...shes still gonna be my little girl that I took up mountains,ponds and streams at early ages.Created a lot of memories with her and more coming up in the future and now her husband wants to learn flyfishing!!! I already geared him up. He's a son I never had. Yeah, I saw that score, boy,you are a busy guy! Thats so great that you love to devote a lot of your time to coach and spend it so wisely teaching kids.You're creating memories for all of them and building bonds with them forever. .Its either all in or not. 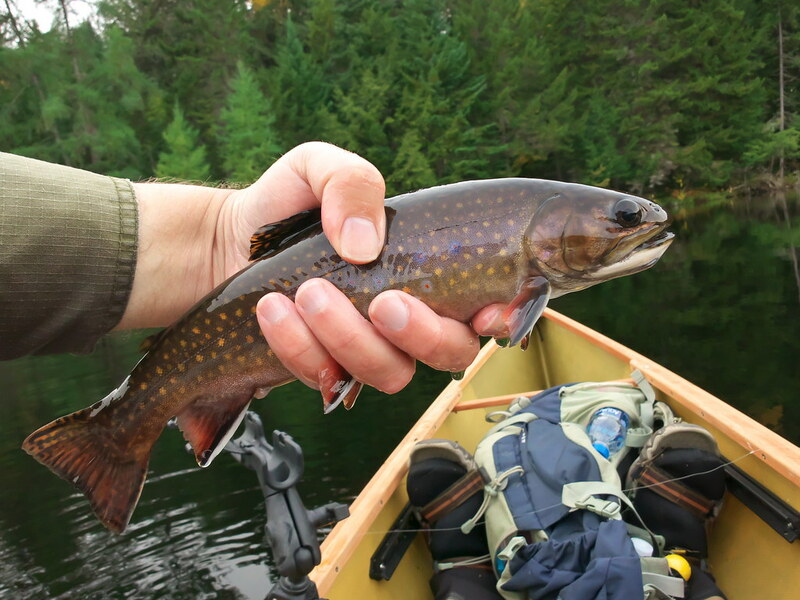 So, hopefully, you'll get out on some year round streams/ponds and/or hook a steely or two! I`ll try to get on here more in the future.Maybe when some of our old buddies will see us gabbing ,they will saunter back too and get involved alittle. 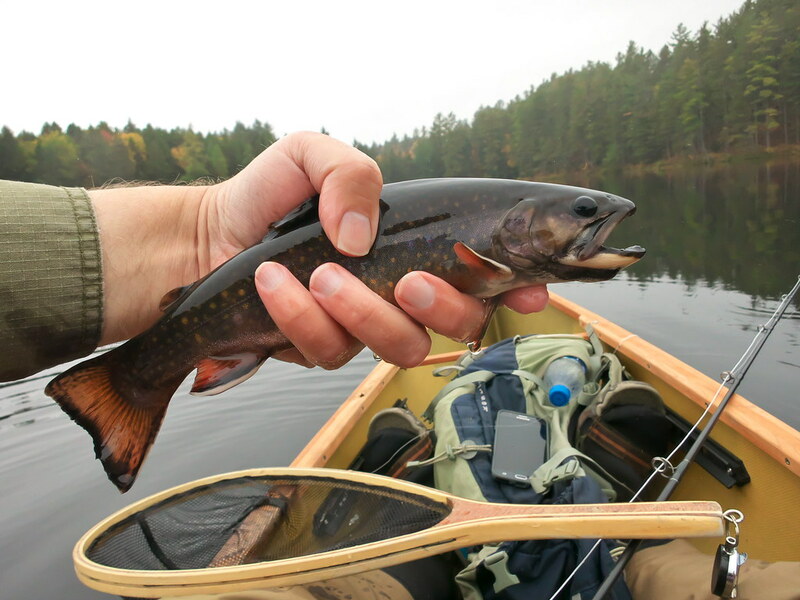 Again, Beartooth91, thank you for creating this post.It started the old fire within me to get the hell out on the water again soon.Love those crisp closeups of those gorgeous Adk. 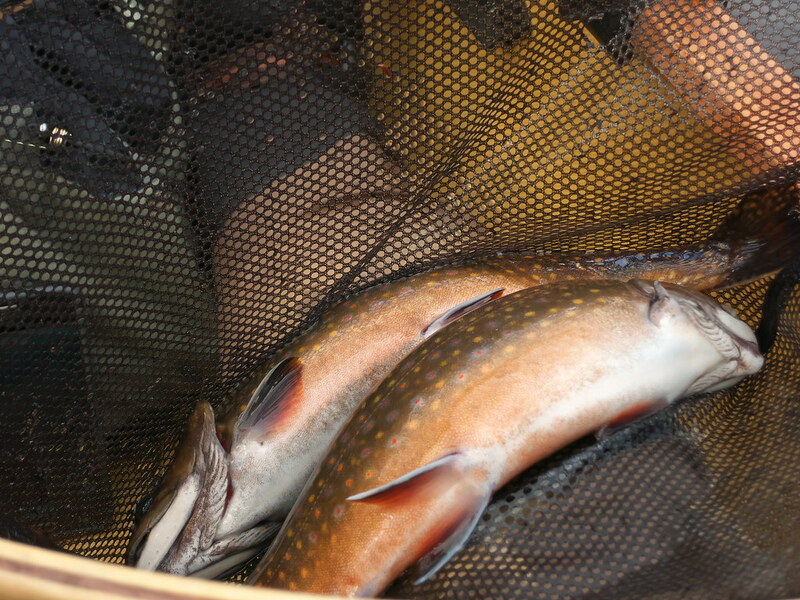 brookies. Sorry, if I hijacked such a nice post. I don't mean to take this thread off topic, so I will be brief. WB asked me in this thread if there are steelhead in the Salmon River yet. I am hearing that there are, but have not fished them yet myself. I will be guiding for Project Healing Waters next weekend and will know much more then. 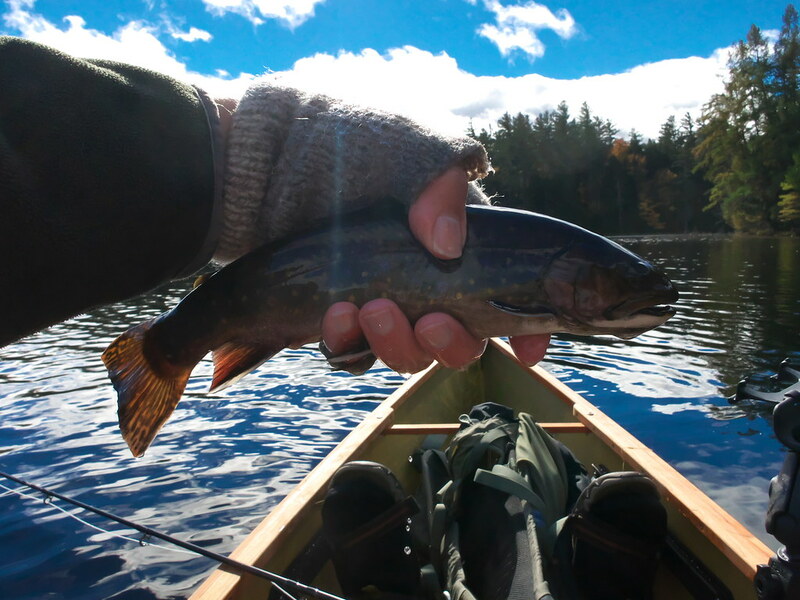 My Autumn brook trout season was generally slow, with some exceptions. Caught plenty of small fish, but not many big ones. Good to hear from you Dave! And also good to know steelies are entering the rivers up there.Please give little info. after next weekend and hope you do well with guiding Project Healing Waters,that is so very nice of you to do that for them.